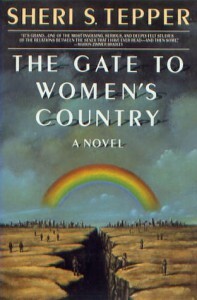 The Gate to Women’s Country, Sheri S. Tepper, Doubleday, 1988, ISBN 9780385247092, 278pp. I read this book for our book club, and that’s pretty much the only reason I would have picked it up. This is not because of its feminist slant, but because I generally despise books about post-apocalyptic societies. I’d much rather read about some horrible technological dystopia than a utopian vision of people running around in furs and gardening. The first third of this book did nothing to dispel that fear that this was one of those books either, from its beginning depicting a feudal ceremony of the lead character Stavia having to part from her fifteen-year-old son to the backflash of Stavia as a young girl learning her craft as well as dealing with her smitten sister. Yes, the mystery starts early and gives you something to hope for: what prompted this division of the sexes and how is it maintained, what is the secret that the Women’s Council possess, and why exactly is Stavia such a basket-case if she’s one of the leaders of this community? Thankfully, this is a science fiction novel, and all these questions are eventually answered, and in such a way to prompt some thought. Like most science fiction novels of ideas (as opposed to those of adventure or style), even at its short 300 pages, this would likely have worked better at half that length. Most of the bulk is built around the time construction of the book where you go from 40-year-old Councilwoman Stavia preparing than performing a mash-up of the aftermath of the Trojan war back to the real action of Stavia learning about her society and alternating between rebelling and fulfilling its destiny. The play conceit is interesting, but destroys some of the tension of the other story (i.e., you know Stavia survives her ordeals) without being clear enough in its underlying thematic elements. That said, I enjoyed the book much more than I expected to, mainly due to Tepper’s skill in plotting and her clear writing style. It’s nice to read a science fiction book that doesn’t try to be hipper-than-thou or more-erudite-without-a-fault. If anything, by having such an unadorned method of delivery, Tepper allows more access to the idea she is presenting, a worthy goal if her intention was to spark debate and discussion (and, ultimately, a perfect choice for a book club book). I disagree with her basic concept for a number of reasons, but I thought it interesting to consider. 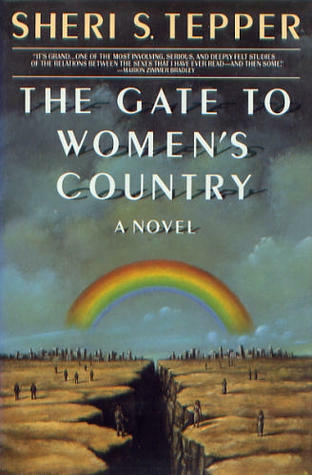 The Gate to Women’s Country didn’t change my mind about post-apocalypse stories (nor did Walter M. Miller Jr.’s A Canticle for Leibowitz or any of the other classic post-nuke-em books), but I don’t regret having read it and may well read another by Tepper in the future. Under the fold are questions (and spoilers) for book club discussion. Does Tepper’s concept that violence can be bred out of human males (following the Laplander method of acquiring more docile bull reindeer) favor genetics over culture? If so, is this a flawed concept or do you agree that violence is a genetic trait in males? Why is a cadre of warriors with nothing better to do (i.e., no real work to speak of) so easily foxed? Wouldn’t a good warrior have better information (maps, spies, exploration teams of their own, preparations)? Or is Tepper saying that violent men are just dumb?